Anyway! 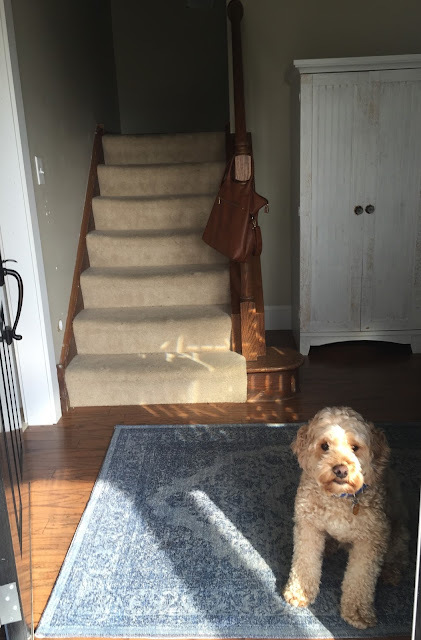 We have been chugging along on some house projects...and if nothing else, I NEED to keep this blog as a record of the changes we make to this dated '91 fixer-upper we call home. We are currently in full-on assault mode trying to conquer the plastic brown baseboards and doors throughout this place. My current focus is our entry. Since that update, the first room of our home that greets you is looking 100% better. But you know how it is...you change one thing and then it makes the things around it look even worse. So, we are now working on updating the architecture in the rest of the entry to match the prettiness of the front doors. In addition to upping the pretty in this space, we need to upgrade the efficiency. Since we don't yet have a mudroom (still holding out hope for someday), our front entry needs to bear the sole burden of organizing five people's winter gear. This means we need a hardworking storage piece (like a dresser), and to re-work the tiny closet so that it actually has room to hold stuff, and doesn't just end up with piles dumped on the floor. 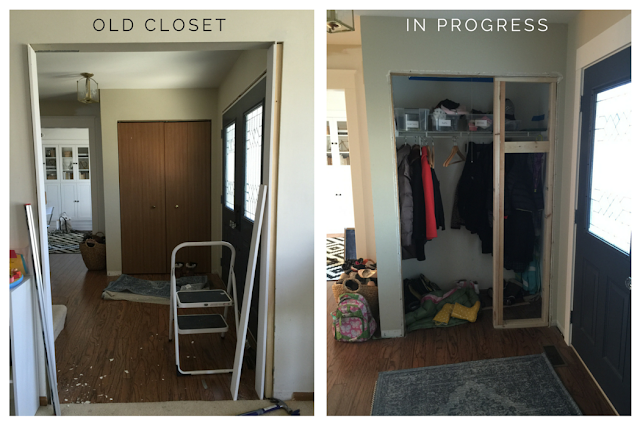 A bonus of this necessary re-working is the opportunity to change from a bi-fold to a single door style on the closet. Tangent. It's easy to get caught up in trends and it's especially easy for me to be all over the board, style-wise. I therefore decided that to stay consistent, architecturally speaking, we are going to stick to the style of my late grandma Kate's house. (The house was on Avery Street, whereby this blog came to its name, in case you ever wondered)! 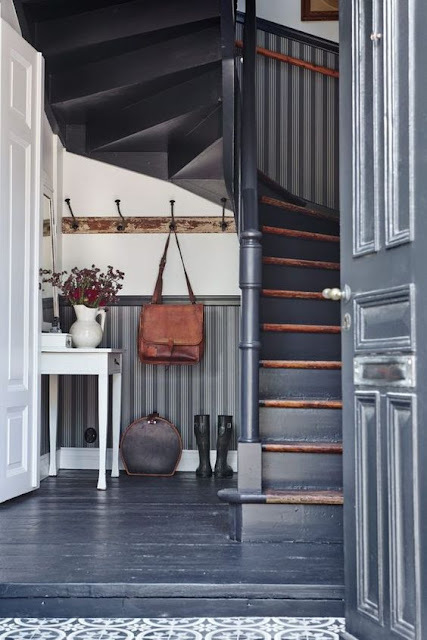 Her home was built in 1910, and though I wish that I had more pictures, I do have records of the staircase railing, mantles, doors, doorknobs and baseboards. And we are using that general style of architecture to determine the updates we make here in our house. All that to say, houses built in 1910 did NOT have bi-fold doors on the closets. 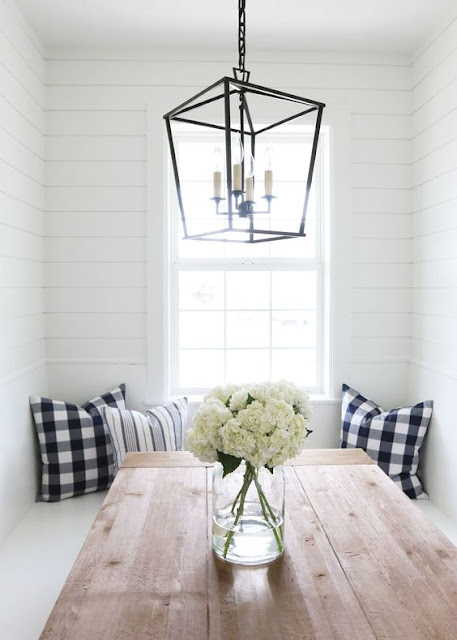 Kate's house is the perfect inspiration. She had boss architecture, a mix of mid-century and antique furniture, and patterned wallpaper all over the place. (She also had a blue room that would make Dorothy Draper proud, and it's my goal in life to replicate it, but that's a post for another day). Greeting you is a sad and dingy staircase. Luckily, you won't notice it because the dog (looking uncharacteristically calm and angelic in this photo) has just hysterically tackled you with excitement upon your arrival. Next to the staircase, against the only wall space in the entry, is a P.O.J. (that's polite for P.O.S.) wardrobe I bought on Craigslist for my daughter's Narnia birthday party last fall. We cut the back out of it and painted it so the kids could all climb through to enter Narnia. Awesome as a birthday party prop; Not so awesome as an enormous waste of space in the entry of our house. It'll either be relegated to the curb or the garage when I can find a dresser that is a better scale for this wall. As you can spy along the staircase, our wall art needs some updating. ;) I am happy to report though that the baseboards are coming along nicely. It used to be a skinny ugly brown plastic-ish trim, so the new white beefy boards look amazing in comparison. They still need to be caulked and painted. If you step through our front door and look left, the entry opens to our playroom. Ryan is in the process of trimming out the door with this simple door trim style, and still needs to add the little crown molding at the top. The trim also needs caulk and paint. To the right after you walk in the front door is the closet we are remodeling, and then past that is my office. If you were to walk straight back instead of going into the office, you'd go to our dining area and kitchen. 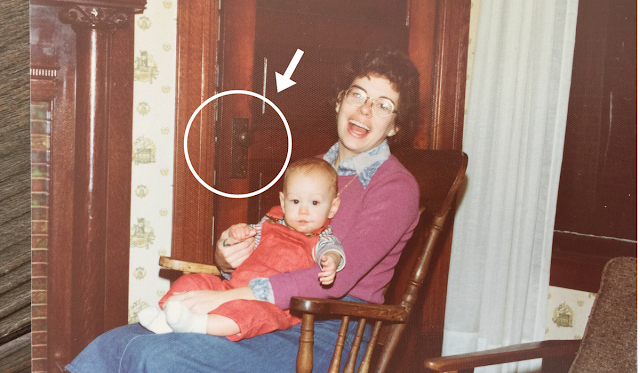 That door, which goes to our basement, was very recently a slab textured brown wood (hideous) with a gold lever doorknob. Since this is the spot I drink coffee every morning, this lovely new door has literally changed my outlook on life. It makes me so happy every day! It too is still in need of the crown on the trim, and caulk, and paint. You also get a good view here of the light fixture. In a weird way, I like it. But it's way too small and our movers smacked it with a couch when we arrived here, a blow from which it never fully recovered. Alright, so that's where we are at. Oh, and I didn't even give you a proper close-up of the massive holes in the staircase drywall, left over from the Baby Gate Era. It's bad. So add a lot of patching to the wish list. I realize there's quite a variance of styles among those pictures. But once you pinpoint some common elements, and extract a favorite or two from each, it's not hard to create a mix that works. 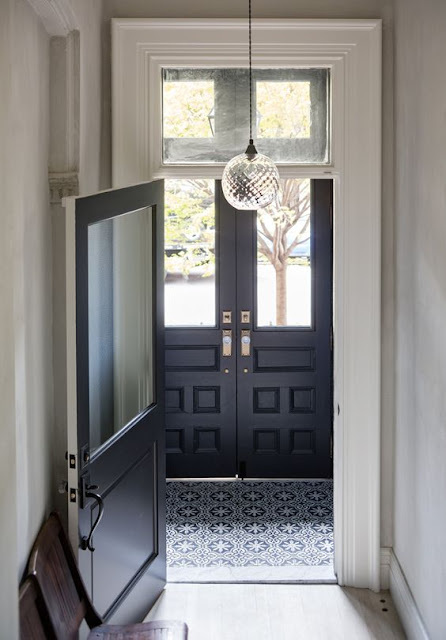 It's equal parts Brooklyn Brownstone and Modern Farmhouse, while being grounded in the pre-war style of architecture from Kate's house. 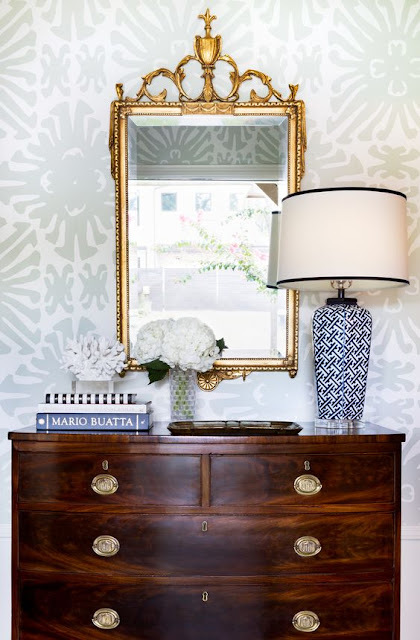 We have some preppy elements (like blue and white Chinoiserie jars), antique touches (mirror and dresser), and there's even a nod to Kate's mid-century style with that graphic check wallpaper (not sure I can actually commit to it, but I love it). I agonized over the doorknob decision for the closet and the basement door. 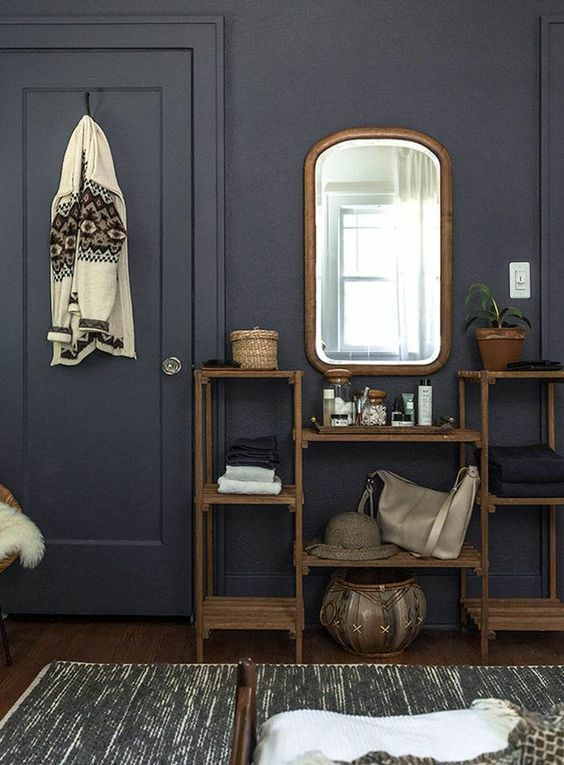 I am using the 5-panel door style throughout the house, but because I am easily bored, I really wanted the closet door to be a different style. 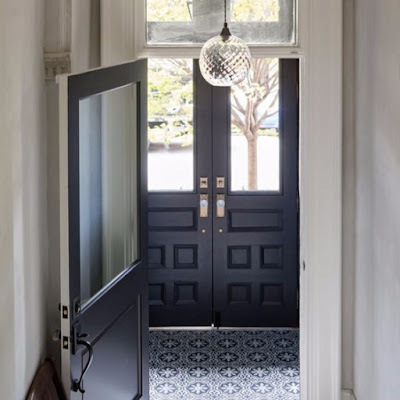 I also didn't want the exact same doorknobs as the front door- so those could really shine- and the design ADD in me was rearing up and rebelling against using the same knobs we are doing in the upstairs half of the house. AND, all those inspiration pictures have me drooling over unlacquered brass. 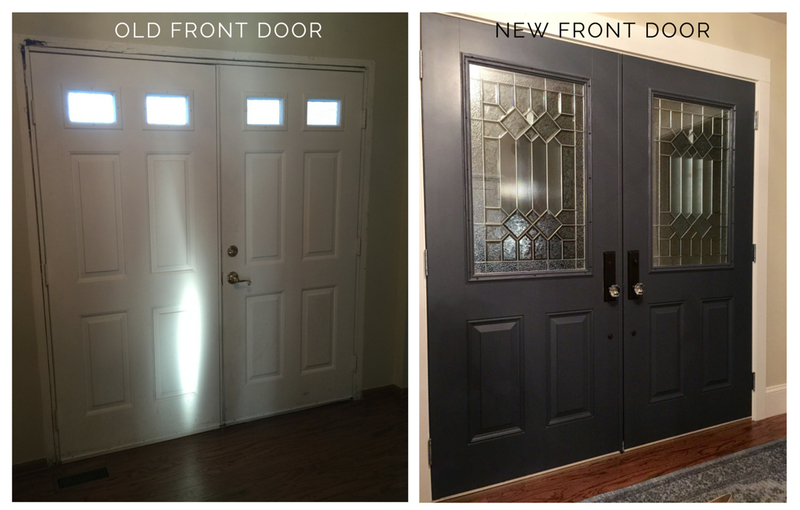 But how do you do three different door styles in one entry, two different paint treatments (because you know I'd love a dark closet door), and two or more different doorknob styles?! Most people would not even attempt this, and would keep things matching to keep it safe. Aaaand that's why my husband will probably get ulcers. I'm definitely opposed to playing it safe. I'd rather play it whatever way makes me jump up and down when the UPS box arrives. 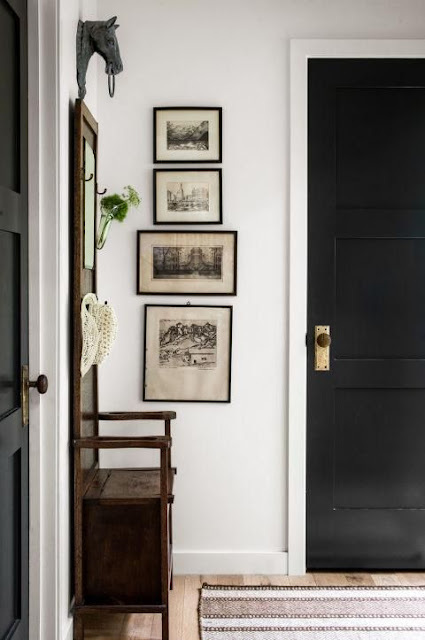 Again, as a starting point, I scoured my photos of Kate's house to find her doorknob style. The only problem? An utterly outrageous price point. None of you are surprised I'm sure. So after all that distress about the style decision, I'm left with two options. One, continue my upstairs knobs (which are $30 a piece and are quite cute) but die inside just a tiny bit, or Two, save in a major way somewhere else and splurge on these knobs for 5x the price (so wrong) but have my heart skip a happy beat every time I walk past a downstairs door. I'm telling you, the freak out and ensuing Instagramming over that UPS box would be one for the record books. Sigh. Well guys, that's the story on what we're up to around here. I'll post updates as they come! In the meantime, I'll be missing you!